Why sea kayakers should consider carrying a PLB, unless they are full sibling to an ostrich. 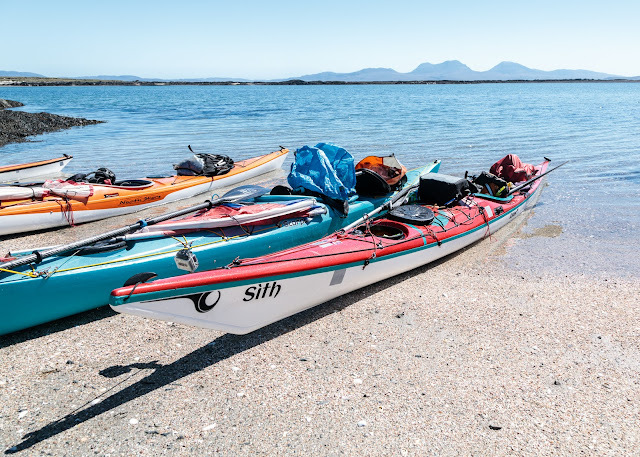 Our journey from Carsaig Bay to Oronsay and Colonsay back in May 2017 continued after a long luncheon break on the sands of Oronsay. The break in blogging has been somewhat longer than that as I have been feeling a bit under par recently. At this, point I should say a very big thank you to Duncan for so generously lending me Sith for this trip. It is just a pity that neither Duncan nor Joan could make this paddling adventure as they had recently returned to Vancouver Island. ...the distant Paps of Jura and the northern entrance of the Sound of Islay on our port side. ...G-MCGG, the coastguard search and rescue (SAR) helicopter from Prestwick, some 120km away to the SE. 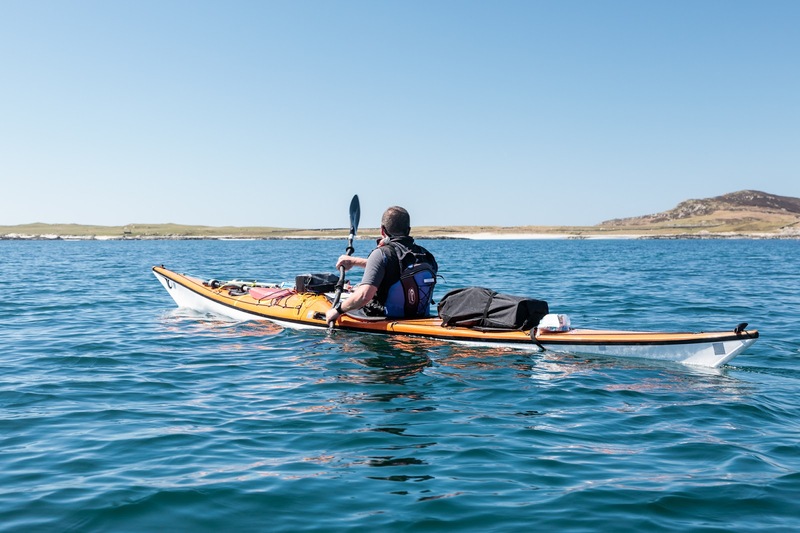 We heard from Belfast Coastguard VHF transmissions that she was on her way to assist a party of sea kayakers in trouble off the Ross of Mull, some 30km to the north. She tipped over slightly as she passed and we could see the crew looking down at us but presumably we did not look like we were in distress and were too far from their search zone. This was a Sikorsky S92 helicopter but two months later it was replaced at Prestwick by a Leonardo (formerly AgustaWestland) AW189. Bristows have operated these SAR helicopters from Prestwick on behalf of the Marine and Coastguard Agency since the previous Royal Navy Sea King SAR helicopters were retired on 1/1/2016. 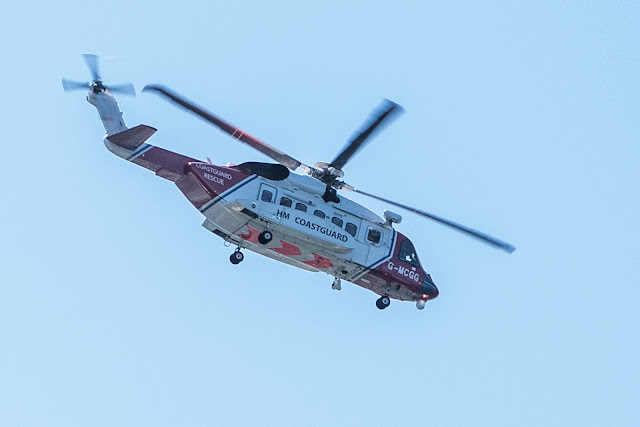 Just a few days previous to our sighting, a MCA helicopter from Prestwick had rescued a surfer from the middle of the North Channel between Scotland and Ireland. The surfer had been adrift after setting off surfing from Westport beach on Kintyre. The tide and an offshore wind carried him off without any means of attracting attention. The search lasted for 32 hours and involved several MCA helicopters from Prestwick, 3 RNLI Lifeboats and 5 shore based coastguard teams. It is quite remarkable that he was discovered. He was found 26km from Kintyre and 21km from Ireland in a search area of nearly 500 square kilometers. After the rescue, one of the crew, Andy Pilliner, said: “Looking out at endless water, you just see something that’s slightly different in the water, from where we looked, it looked perhaps like a buoy, but it warranted further investigation so we dropped in height a bit and came in and it was that moment, oh it is actually a surfboard and there’s someone on it waving. It's just a great feeling, it’s just what you’re hoping for." The rescued surfer said "I cannot thank those enough who rescued and cared for me, they are all heroes." 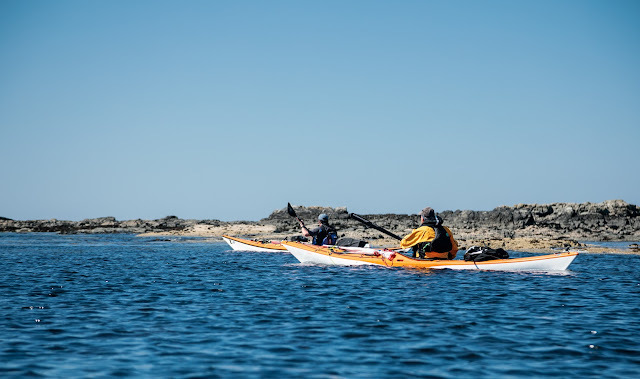 This remarkable rescue is a very good reason for water users, such as sea kayakers, to carry personal locator beacons (PLBs). By setting one off, if you are ever in a life threatening situation, you can help the rescuers find you quickly. This not only saves the rescue services considerable effort but it also reduces the time their personnel are exposed to danger. 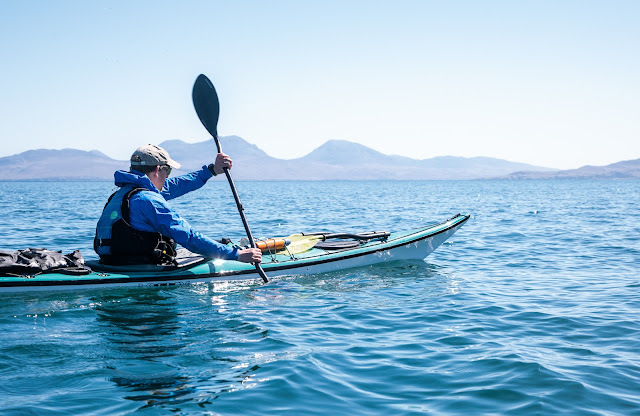 I have been carrying a PLB while windsurfing and sea kayaking for the last 12 years. My first PLB cost nearly £600 but the Ocean Signal rescueMe PLB1, which I now carry, is currently only £200. Given the overall cost of sea kayaking gear and transport this is a minor expense. (I burned £40 of fuel getting to our launch point for this trip and I live closest!) So I can't think of any good reason why a responsible sea kayaker would not nowadays consider carrying a PLB unless, perhaps, they are full sibling to an ostrich. Fortunately we were in no difficulty and C-MCGG flew on and successfully assisted the kayakers in trouble while we landed on Oronsay. As we made our way up the beach at the head of the long inlet of Port na Luinge (long port! 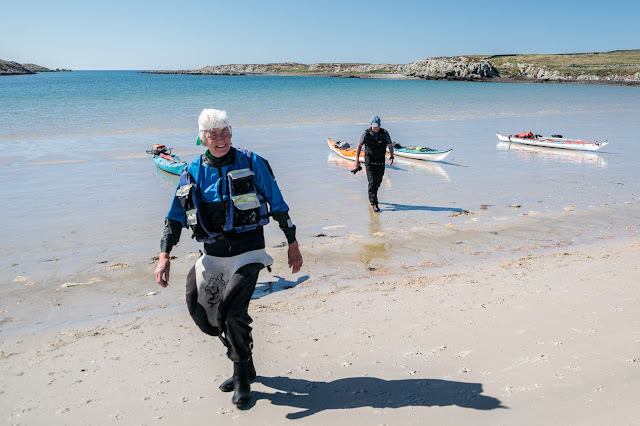 ), we were following in the footsteps of our ancestors and our own pilgrimage to the Isles had nearly come to an end.